"Have you been good, this year?" Santa's question always finds me scrambling for reasons to say "yes". Most people comment on how quickly the year goes by, when things we thought we would start or finish remain untouched. I am a list maker and still use a paper diary, noting down the jobs I need to do each day and each week. I love to place a tick beside the completed task. I also begin the year writing down ideas, projects and goals. Sometimes, those things don't become reality until future years. I had a poster of the New York marathon on my wall for 12 years before I actually completed it! We dismiss our positive achievements and chastise ourselves for what we didn't do. When you reflect back over the year, you will realise just how much you have done ... and will unreservedly answer "Yes!" to Santa. Best wishes for a restful Christmas and a wonderful 2016. Like "Goldilocks", finding the "just right" information on health issues is fraught. One example is finding the balance between avoiding sunburn and getting enough exposure to the sun for vitamin D uptake. For short periods, direct sun on your skin, is now recommended. It is well known that we need to regularly check freckles, marks and moles, but there are some areas that can be overlooked. Ask your hairdresser to check your scalp and ears. Ask your dentist to check inside your mouth and lips. Ask your podiatrist to check between your toes and on the soles of your feet. Blisters are more likely during warmer, humid weather. A nifty trick is to turn your socks inside out and place in a plastic bag. Sprinkle over foot powder, close and shake. Your socks will be nicely coated and once turned back in the right way, will keep your feet dry during your walk. Your hands may also become softer and rub against the Nordic Walking pole straps. 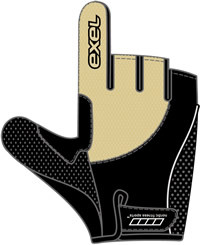 Keep some plasters on hand or purchase a pair of Nordic Walking gloves. These breathable, specifically designed gloves help to absorb perspiration, protect your hands from sunlight and keep your hands warm in winter without moisture build-up. In July, Paul Stevenson travelled to Xining, Qinghai Province, north-west China. The Qinghai Mountain Association, along with the International Nordic Walking Federation (INWA), co-hosted a two day walking/nordic walking event. As Vice President of INWA, Paul not only represented the organisation, but provided a critical analysis of the race organisation. The Quinghai Province wants to attract international tourists to this event and sought input to ensure the event met visitor expectations. The event consisted of a 23km walk on day one and a 22km walk on day two. Over 6,000 walkers, including 1,200 Nordic Walkers were present. As Paul was part of the official party, all of the participants were ahead of him, when he started. His competitive nature kicked in as he was determined to finish near the front. However, the Chinese walkers were overawed by his presence and upon seeing him, would run ahead to take photos and "selfies" with their phones. Therefore, he had to weave through the crowd, covering more distance than expected. At about the 7km mark, one of the men saw what was happening and decided to become his "minder." This "minder" would jog ahead, calling out to those in front, clearing the way for Paul. He continued this until the 18km mark, by which time, Paul was near the front. At the finish, Paul waited for his new best friend and gave him a silver fern badge, which he was delighted to receive. Paul wasn't sure if it was his height or the fact that he was one of the few international participants that attracted the desire for photos. With the number taken, he wished that he had charged a fee! 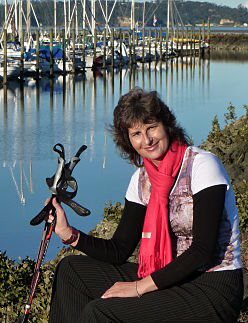 Ten years ago, in New Zealand, nobody had seen or heard of Nordic Walking. June first experienced the activity while attending a fitness conference in 2004. She was an instant convert and began Nordic Walking immediately. During 2005, Beattie Matheson Ltd. began importing the poles and it was a fortuitous meeting between this company, June and other early adopters that saw the activity and training take shape. Enduring sniggers, "where's the snow" comments, hostility from race walkers and uninformed media commentary, the first meagre groups of Nordic Walkers began to be seen walking around the cities, beaches and parks. Courses of tuition became available. 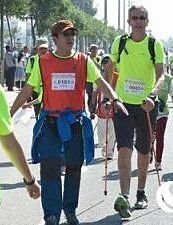 Once race directors of events understood the activity, Nordic Walkers were invited to participate in distances from 5km to 100km. The benefits were being noted and health professionals trained to become instructors or recommended the activity to their clients. In 2015, many people are now aware of Nordic Walking. They know it is different to tramping. They have an understanding that the upper body is activated and of the numerous health and fitness benefits. While it is a "fitness first" exercise, with many Nordic Walkers able to compete in endurance events or ultra distance walks, it also has a terrific application in rehabilitation or within special health populations. 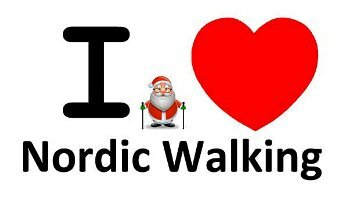 As Nordic Walking has integrated in to the physical fitness landscape, the sniggers and comments are rare. Groups meet regularly to walk and together have built fitness and friendships. 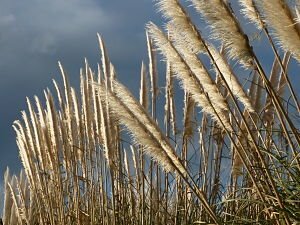 A network of certified instructors is in the main centres of NZ. It is a wonderful activity. With the addition of a couple of poles and correct technique it really is "Total Body Walking!"